Raza Ahmad Rumi is a Pakistani policy analyst, journalist and an author. 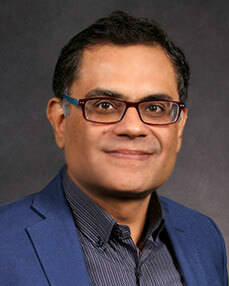 He is Director, Park Center for Independent Media and teaches in the journalism department. Raza is also Visiting Faculty at Cornell Institute for Public Affairs. During 2015-2017, Raza was a scholar in residence at IC and taught courses in journalism and writing departments as well as at the Gallatin School of Individualized Study, New York University. Rumi has been a fellow at has been a fellow at the New America Foundation, United States Institute of Peace and the National Endowment for Democracy. He is a member of think tank at Laboratory for Global Performance and Politics, Georgetown University; and a nonresident fellow at the Berkley Center for Religion, Peace and World Affairs. 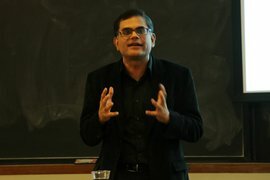 As a journalist, Raza is affiliated with the Daily Times (Pakistan). Earlier he worked with The Friday Times, Pakistan's foremost liberal weekly paper as a writer and an editor for a decade. Raza is also a commentator for several publications which include Foreign Policy, Huffington Post, New York Times, The Diplomat, Fair Observer, CNN and Al Jazeera, Daily O, Scroll India, The Hindu and Indian Express, The News, DAWN and Express Tribune, Pakistan. In Pakistan, he also worked in the broadcast media as an analyst and hosted talk shows at Capital TV and Express News. Raza was also a Director at Jinnah Institute, a public policy think tank and Executive Director of Justice Network- a coalition of NGOs. Raza’s work as a public policy practitioner builds on his stint with the Government of Pakistan’s Administrative Service and United Nations Peacekeeping Mission in Kosovo where he acted as a municipal administrator in charge of local governance. In 1994, he entered the Pakistani civil service after topping the countrywide competitive examination. He holds a bachelors and masters degree from London School of Economics. His journalism related work, especially broadcast mass media, brought him under the surveillance of Islamists and their patrons in Pakistan. A militia linked to Taliban attacked Raza in March 2014. He narrowly survived the assassination attempt but his driver died. Thereafter, he moved to the United States. He is the Delhi by Heart: Impressions of a Pakistani Traveller, The Fractious Path: Pakistan’s Democratic Transition and Identity and Faith and Conflict. His most recent collection of essays Being Pakistani: Society Culture and the Arts was published in June 2018 by Harper Collins, India.